Love this yarn for so many reasons: It's a gorgeous color, it's super soft, and it was made by an awesome indie dyer, so what more could I possibly ask for? Recognize it? 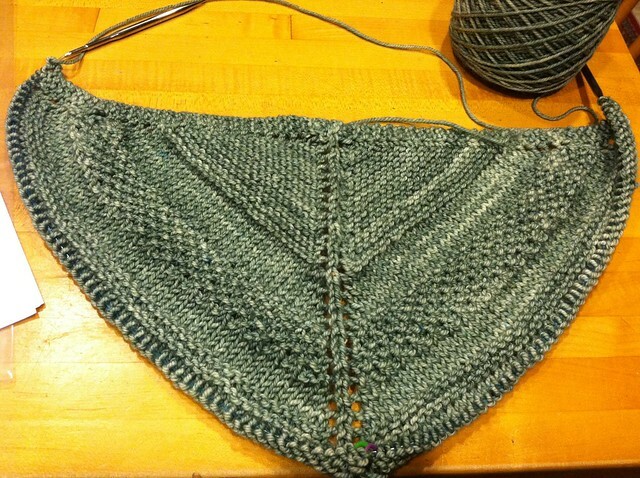 It's the Texelle Shawl! I needed a break from all the gift knitting, so it's my side project. I'm worried about the rapidly increasing planned project/WIP/stash yarn situation I seem to be having, so I hope that I can get this (and my other projects) finished up relatively soon for the new year. The cardigan I'm planning (with the alpaca I bought from the farm- remember that?) will have to wait. I have a sinking feeling it'll be a next-fall FO, sadly. Thank you, Brenda! I can't wait to do my FO post on Monday... Photos today!